The peace of the Long Night is over, and we must fight for our very survival. Each of us, the so-called lords of the night, claims domains and influence across this fractured continent. Some of us stand as feudal lords, others as gods, but it is over these lands and these hearts that we do battle. 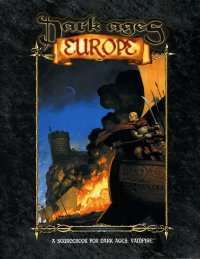 Dark Ages Europe is the major setting book for the new Dark Ages line. All the nations and kingdoms of medieval Europe are examined, along with the vampiric monarchs and fiends who infest them. From the Languedoc rent by the Albigensian Crusade, to the vampiric Baronies of Avalon ruled by the Methuselah-God Mithras, Dark Medieval Europe is a dangerous place. Be sure to learn your way around.